A small blogpost how you can create users and groups with WLST scripting in Weblogic. This can be handy when you have a lot of application environments for Dev, Test ...) In WLST there is no default WLST function for creating users and groups, but in the serverConfig() we can lookup the right MBean and call the createUser, createGroup and addMemberToGroup operation. Here is an example of the user creation phyton script. With BlazeDS we can push data from the J2EE container to the Flex clients just like Adobe Life Cycle Data Services can. In blog I will use the Message Broker and Service Adapter of BlazeDS in combination with EJB3 Entity / Session Bean to push every change to the client. 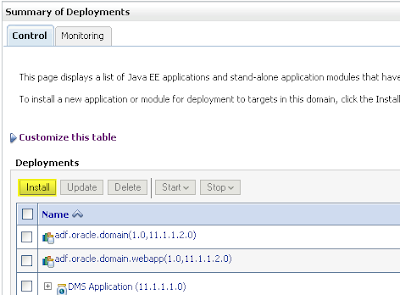 The Message Broker routes the messages with the EJB entities to the custom service adapter. The service Adapter is a service, which registers all the subscribed Flex clients and publish the changes to these client. For this example I used JDeveloper 11g and Weblogic. ( For more information see my previous blog ) . This are the steps we need to do to make this work. Create an EJB client for the changes. My HRSessionEJBBean Session Bean, this Bean has a remote interface. JDeveloper can generate this Session Bean for you with its remote interface. This Bean contains the Message Broker code which routes the messages with all the employees when the persist, merge or remove method of the EntityManager is called. 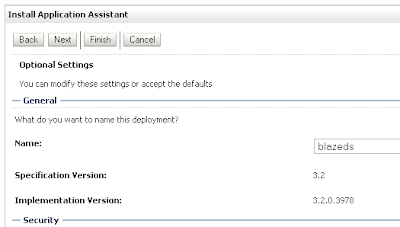 Create the Blaze Custom Service Adapter, we will add this adapter later to the BlazeDS configuration files. This adapter will do a JNDI lookup of our EJB Session Bean and pushes the messages to the connected Flex clients. The services-config.xml which import the messaging-config.xml configuration file and contains the streaming-amf channel configuration. We are finished with the java part and we can work on the Flex part. We can start the J2EE container and the Flex client. To test this we can use an EJB test client which adds a new Employee and look in the Flex application if we can see this new Employee. In a earlier post I already made Adobe Flex / BlazeDS / EJB2.1 example and this example was deployed on an OC4J J2EE container. In this post I let the same example run in Oracle Weblogic 10.3.2 ( FMW11g) with the BlazeDS jars as a shared library ( this also works with Adobe Lifecycle). Also in the earlier post I needed to use EJB2.1 but with EJB factory of Peter Martin I can use Eclipselink. To start, we need to download BlazeDS and EJB and Flex Integration jar, Extract these archives so we can copy the jar files to a new location. We need to make a shared library for weblogic. This is better then just add all the jars to WEB-INF/lib folder of every web application. You can patch the blazeds jars without re-deploying your webapps and you now know exactly which version of blazeds you are using. In the META-INF folder we need to add two files application.xml and MANIFEST.MF where we will add the library information for weblogic. We are ready to add this library to the Weblogic Server. The library folder is on the same file system as the weblogic server so I don't need to make an EAR file, I can just use the exploded folder. 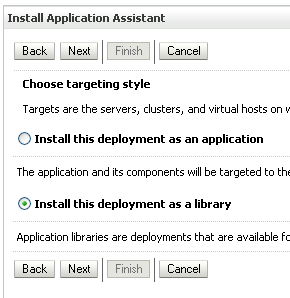 Open the Weblogic Console and go to Deployments. Here we can install a new Deployment. 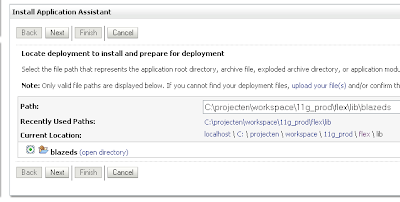 In the deployment page we can see the blazeds library. The last steps is to configure the web.xml for blazeds and the blazeds configuration files for the EJB call. first the web.xml of the viewcontroller project. Deploy everything to the Weblogic server. and at last the Adobe mxml where I call the getEmployeesFindAll method.